"This is a delicious dish. It is an authentic Chinese recipe that I use for my cooking. Baby bok choy and mushroom are the two main ingredients. " In a bowl, mix together the oyster sauce, soy sauce, and brown sugar until the sugar has dissolved. Mix the potato starch and water in a small bowl, and stir it into the oyster sauce mixture until smooth. Fill a pot with water, bring to a boil, and stir in salt and vegetable oil. Place the bok choy into the boiling water, and cook until tender, shiny, and bright green, 2 to 3 minutes. Drain the bok choy, and arrange attractively on a serving platter. Heat the olive oil in a large skillet or wok until the oil shimmers, then toss the green onion and garlic in the hot oil until fragrant, about 20 seconds; stir in the mushrooms. Cook and stir until the mushrooms begin to shrink slightly. Sprinkle the mushrooms lightly with salt. Continue to cook the mushrooms, stirring often, until they are tender, about 5 minutes. Pour in the oyster sauce mixture, then stir until the sauce is thickened and coats the mushrooms, 30 seconds to 1 minute. 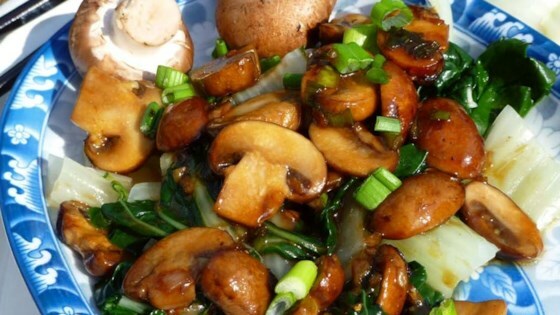 Pour the thickened mushroom sauce over the bok choy; serve immediately. Too salty. But I love the thought and the general idea! I'll play around with it again. Mmmm...this was great, but a bit salty. I will not sprinkle salt on the mushrooms next time.